One of most notable qualities of Motherwell's collages of the 1970s is the contrasting tensions between classical control and unrestrained expression. As with his previous work, these collages grew out of an ongoing dialogue with his paintings; indeed, they would seem to be attempts to bridge ideas Motherwell was exploring in two recent series of major paintings, the Elegies and the Opens. The Elegies were a series of brush-gesture paintings which Motherwell began around 1960. These paintings, including Black on White, 1961 (coll. Museum of Fine Arts, Houston); New England Elegy, 1966 (John F. Kennedy Federal Building, Boston), and the variations of the Beside the Sea series (1962-1966), were spontaneous, intuitive images concerned with primitivity and the "element of the savage in the human soul." (H.H. Arnason, Robert Motherwell, New York, 1982, [revised edition], p. 63). They most often consisted of bold gestures of black paint spraying out into space. 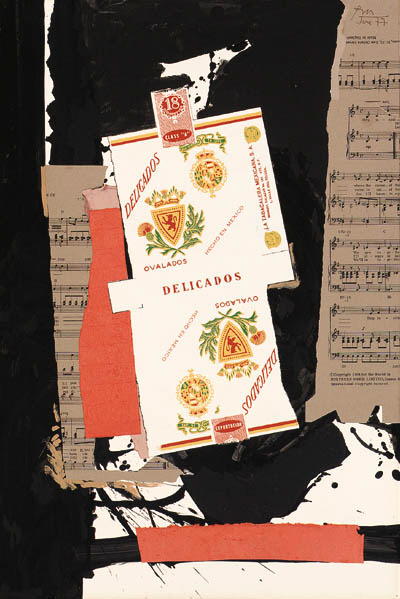 In Delicados, Motherwell used this prominent motif as the underlying, painted element of the composition. Yet the wildness of the jet-black burst is held in check by the controlling forms of the collage: the borders of sheet music, the hard edges of red paper, and the axis of the dissected cigarette carton -- all elements inspired from the ordered compositions of the Opens. H. H. Arnason has likened the collages of the 1970s to "a sort of relief sculpture", in which the plane advances towards the viewer as opposed to receeding into space, and he draws comparison with the work of David Smith (ibid., p. 84). Motherwell was concerned with the expressive possibilities of abstraction which, for him, did not preclude representation of some sort. "A picture is a deliberate choice of a certain degree of abstraction," he once said. "Once one can get over one's inherited primitive feeling that what a picture is is a picture of something in nature and thinks instead that a picture is a deliberate choice of a certain degree of abstraction ..., then one begins to view painting in an entirely different way . . ." ("On the Humanism of Abstraction," 6 February 1970, quoted in ed. T. Terenzio, The Collected Writings of Robert Motherwell, New York, 1992, p. 176). The abstraction that Motherwell has chosen in Delicados involves nature as perceived by all of the senses: the sound of music; the scent and taste of smoke; the feel of the sea and salt-water spray -- all organized into an arresting and delicately poised visual image.